The SSTUWA Vice President, Samantha Schofield, has been granted a period of 12 months parental leave, to be taken over the whole of the 2019 calendar year. The SSTUWA rules are silent on the matter of the taking of leave by elected senior officers. However, Executive is of the view that, while this is not a casual vacancy, the rule governing the filling of casual vacancies is the most appropriate rule in this instance. (a) The Executive shall have power to fill any vacancy occurring in those offices enumerated in Rule 25(a) subject to sub-rule 26(b) thereof. (b) Any casual vacancy in the offices of President, Senior Vice President and Vice President or General Secretary which occurs at a time when more than half of the term of office remains unexpired, shall be filled by election by and from members using, as far as is practicable, the same mode of election as is prescribed in these Rules for the conduct of Union elections, provided that Executive may appoint a financial member to act in that position, pending such election, subject to the requirements of sub-rule(d) hereof. Any person so elected shall be entitled to hold office until the expiration of the term of office being held. (c) Any such vacancy occurring within eighteen months of the expiration of an elected officer’s term of office shall, subject to sub-rule (d) of this Rule, be filled by a financial member of the Union appointed by the Executive provided that any person so elected or appointed shall hold office by virtue of that election or appointment for no longer than the unexpired portion of the term of office of the person whom s/he was so elected or appointed to replace. (d) In filling a vacant office or offices in accordance with the preceding sub-rule the Executive shall appoint the Senior Vice President as Acting President if the Presidency falls vacant and the Vice President as Acting Senior Vice President should the latter’s office fall vacant or should the Senior Vice President be appointed Acting President. Should both offices of President and Senior Vice President fall vacant at the same time the Executive shall appoint the Vice President as Acting President. 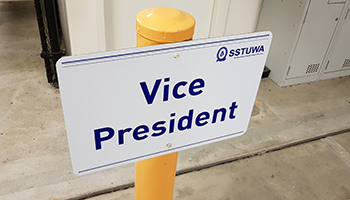 Accordingly, Executive has determined that Expressions of Interest from financial members of the SSTUWA be called to fill the position of Vice President. It should be noted that the SSTUWA Rules require the Vice President to reside in the metropolitan area during his/her term of office [Rule 27 (c)(ii)]. Expressions of interest should be addressed to the SSTUWA President at president@sstuwa.org.au and must be received no later than COB 29 August 2018.